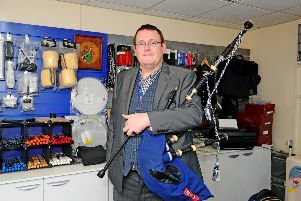 Falkirk band Primes have certainly got a lot to pack into the next 12 months. 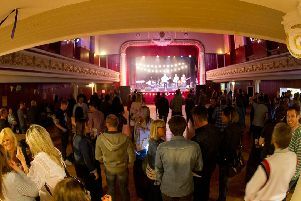 The big news is they have earned a spot in Party at the Palace on August 11 – but before that they will grace the stage at the Forthside Festival in Stirling on May 4, the new Vibration Festival in Falkirk’s Callendar Park on May 25 and then head down south for a tour of England in July. All this would add up to an amazing year for any band, but when you consider this is only the second year Ollie Kitchen (vocals/bass) Sarah Monteith-Skelton (guitar/vocals) and Reece Ryan (drums/vocals) have been together it’s even more remarkable. The band certainly started fast – their first ever gig was at a sold out King Tuts in Glasgow – and show no signs of slowing down. Sarah said: “Ollie and I have been on the music scene for a few years. We got together through friends and had a jam and he asked If I would fancy starting a band. Reece is actually my nephew and we got him on board as drummer. Primes have a hometown gig at Behind the Wall on March 2, where they will hopefully remember to play their new single Don’t Forget Your Memories, which is released tomorrow (Friday), following on from crackers like Breathe, Together Forever, Haunted and Bodies which have become the cornerstones of the long-lasting mighty musical fortress the band is currently constructing. Describing themselves as melodic alternative rockers in the mould of the Foo Fighters and the Kings of Leon, Primes have the chops to entertain the masses at outdoor festivals and the tunes to capture and indefinitely hold the attention of listeners tuning into the radio or checking out the latest downloads. “Our songs are really radio friendly,” said Sarah. While it may seem they have been on the fast track to success, at least two thirds of the band admit to being anything but overnight sensations. The slog continues in 2019, but it’s going to be a pleasurable journey when your sharing stages with the likes of Deacon Blue, Wet Wet Wet, Fun Lovin’ Criminals, Feeder, The Coral and Alabama 3 in the coming months. Visit www.primesband.co.uk or www.facebook.com/primesbandofficial for more information.